If you’ve been diagnosed with hearing loss in San Rafael, hearing aids are likely to be the solution your audiologist recommends. But selecting a pair isn’t a simple process; there are many factors to consider. In honor of National Audiology Awareness Month, celebrated every October, we’re going to talk about the importance of hearing aid consultations in helping you choose a pair of hearing aids that are best suited for your hearing loss. What is a Hearing Aid Consultation? National Audiology Awareness Month gives audiologists an opportunity to spread awareness of audiology and educate the public on hearing protection. Considering the prevalence of hearing loss – 48 million people nationwide are affected, meaning about one out of every five Bay Area residents experiences hearing impairment to a certain degree – many people will get to know an audiologist pretty well. What they might not understand is how important a hearing aid consultation is when it comes to selecting hearing aids. After all, hearing aids aren’t one-size-fits-all. There are a wide variety of styles available from many different manufacturers. Choosing the right ones without having a hearing aid consultation would be akin to throwing a dart at a board. The hearing aid consultation is a multi-step process. Your audiologist will discuss the different types of hearing aids available and help you select one that is appropriate for your lifestyle and hearing needs. He or she will go over care and maintenance of your hearing aids, teaching you how to use them correctly and make adjustments for different hearing environments. You’ll learn how to change the batteries and clean them properly. Next up is the fitting. This involves programming your hearing aids to the optimum settings for your specific hearing needs. 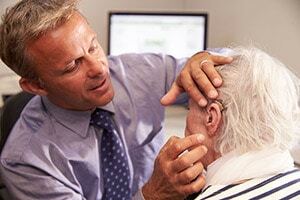 Your audiologist will check the physical fit to make sure they are comfortable and, after programming them to your hearing loss and lifestyle needs, will have you try them out. This test run allows your audiologist to measure the volume levels to ensure you are properly hearing the full range of sounds and make adjustments to provide the correct levels of amplification for your hearing loss. Another important step of the process is counseling. Your audiologist wants to ensure you have realistic expectations for your hearing aids. It’s important to understand that they are not a cure for hearing loss – there is no such thing – and they do have certain limitations. However, they will help you communicate more easily and, when used correctly and consistently, should noticeably improve your quality of life. Learning what to expect from your hearing aids before you ever wear them will help you achieve the maximum benefit. In addition, you’ll learn tips and strategies for better communication. After you’ve been wearing your hearing aids for a short period, you’ll come back for a follow-up visit. During this appointment, your audiologist will fine-tune and adjust your hearing aids as needed, taking time to answer any questions you might have. Keep in mind that it often takes several weeks to adjust your hearing aids to their maximum effectiveness, so additional fitting appointments might be needed during the rehabilitation process.